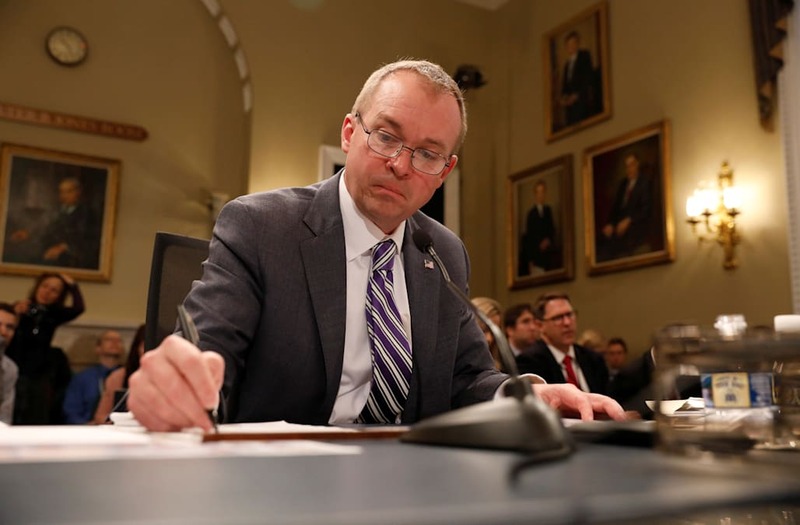 Office of Management and Budget Director Mick Mulvaney promised big changes to the nation's top consumer watchdog agency Monday, but that it would "stay open" for now. “Rumors that I’m going to set the place on fire or blow it up or lock the doors are completely false,” Mulvaney said during a news conference at the Consumer Financial Protection Bureau Monday. But, he added, "Anyone who thinks that a Trump administration CFPB is the same as an Obama CFPB is wrong." Mulvaney, Trump's pick to temporarily lead the agency, has been an outspoken critic of the CFPB and previously advocated for its demise. His new role hasn't changed those “principled misgivings,” he told reporters, though he noted that the Dodd-Frank Act, which created the bureau during the Obama administration, doesn't allow him to do away with it on his own. “I’m just learning about the powers that I have as acting director,” Mulvaney said. “They would frighten most of you” due to “how little oversight Congress has over me now." When asked if he would shutter the CFPB if given the legal opportunity, he signaled that he would advocate shutting it down. Other agencies could absorb its watchdog role, Mulvaney argued. Though Mulvaney described his first day at the bureau as "extraordinarily smooth," it was also plagued with questions and confusion over his legitimacy as acting director. Mulvaney's opening parry was an email telling CFPB staff to ignore all communication from Leandra English, the agency's deputy director who assumed the acting director role upon former chief Richard Cordray's resignation last week. English sent her own email to agency employees. In his memo, Mulvaney told CFPB staffers to "disregard any instructions you receive from Ms. English in her presumed capacity as Acting Director" and to report any "additional communications from her...related in any way to the function of her actual or presumed official duties" to the general counsel. "I apologize for this being the very first thing you hear from me," the memo from Mulvaney continued. "However, under the circumstances I suppose it is necessary." He encouraged staffers in the office to "please stop by the 4th Floor to say hello and grab a donut." Mulvaney swatted down reports that both he and English were at work at the bureau Monday. "I can assure you there was one person at work who showed up today to be director," Mulvaney said. "She wasn’t here." But that doesn't mean she won't be in the future. Mulvaney left English's job status at the bureau unclear as she battles to take charge. English filed a complaint Sunday night against both the president and Mulvaney, reasoning that the Dodd-Frank Act gave her legal authority to assume the role of acting director when Cordray resigned Friday. Her suit seeks a temporary restraining order to block Mulvaney from taking over the bureau. U.S. District Judge Timothy Kelly, a Trump appointee, heard from lawyers for both sides late Monday on the question of who's the real acting director. He said he'll wait to rule until he sees a written response from the Justice Department. The White House said "the law is clear" — and in their favor. "Everybody is in full agreement that he's in charge," White House Press Secretary Sarah Huckabee Sanders told reporters Monday afternoon, adding that the administration believes the bureau will be "much better" run under Mulvaney. “We’re not going to put political ambitions as the number one priority. We’re going to make sure the consumers are actually being protected, which is what the agency was created for," Sanders said. The legal quandary didn't stop the OMB director from reporting for duty Monday morning, armed with donuts and confidence. Asked by NBC News if he felt he had legitimate authority over the CFPB, Mulvaney replied, "Yes, yes I do." Mulvaney has previously argued in favor of killing the bureau, calling it a "joke" in a 2014 interview. Mulvaney was a congressman at the time. But even during his confirmation hearing earlier this year for OMB director, Mulvaney bashed the agency as being "run by essentially a one-person dictator who believes he can’t even be fired by the president but for cause. We have created, perhaps inadvertently, the very worst kind of government entity." Democrats, meanwhile, have championed the bureau's work and attacked Trump's choice of leader. Senator Elizabeth Warren, D-Mass., tweeted Saturday: "The only thing that will turn the @CFPB into a disaster is for @realdonaldtrump to ignore Dodd-Frank & name an acting director determined to destroy the agency." While the administration has painted the CFPB as unruly and ineffective, the young agency has taken several actions that live up to the watchdog role it was created to serve. In 2016, the agency fined Wells Fargo $100 million for secretly opening unauthorized accounts and funding them with money transferred out of authorized consumer accounts. And just last week, the CFPB ordered Citibankto pay $3.75 million back to customers, as well as a $2.75 million civil money penalty, after misleading student loan borrowers about eligible tax deductions and erroneously charging them late fees. On Monday afternoon, the CFPB's website did little to shed light on who was in the driver's seat. While its "newsroom" page announced Leandra English as acting director, the "about the director" page could not be reached — even with a direct link. But Mulvaney already announced the agency's first few changes: A temporary freeze on hiring and the issuance of new rules, steps similar to those taken across other government agencies at the outset of the Trump administration.